Desktop globe classic! 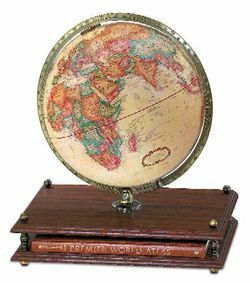 This useful combination offers the “best of both worlds.” The stand is home for a hardbound Rand McNally World Atlas and the 12" diameter antique ocean globe rests in a calibrated brass-plated full-meridian. The cherry wood grain base enhances the Premier’s rich appearance.